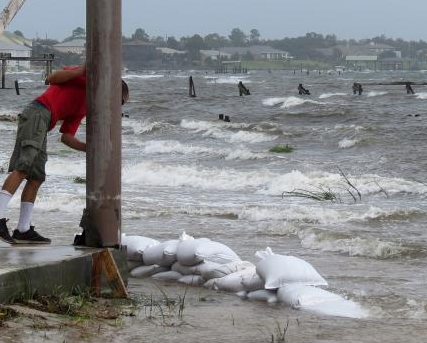 Hurricane Isaac pounded the Gulf Coast region yesterday. On August 29, 2005, as Hurricane Katrina slammed into the Gulf Coast as a category 5 storm, residents were forced to leave their beloved pets behind as rescue crews pulled stranded citizens to safety. The vast majority of safety shelters would not accept animals, so thousands of dogs, cats, and small pets were abandoned during what would become one of the deadliest natural disasters in U.S. history. The loss of human life was staggering; the final death toll as it stands today is 1,836 people, with 705 still reported missing today. And though it’s difficult to know exactly how many pets lost their lives as a result of the catastrophic storm, experts estimate that nearly 600,000 companion animals were killed. Fast-forward seven years to August 2012 and the scene looks quite different. As Gulf Coast residents in Louisiana, Alabama, and Mississippi endure after the landfall of Hurricane Isaac, a category 1 hurricane that as of Wednesday has been downgraded to a tropical storm, pet owners can breathe easier knowing that plans are in place to rescue, take in and care for their animals this time around. Before firefighters could pull 70-year-old Fred Leslie from the attic of his flooded home in Braithwaite, Louisiana, Leslie made sure that his four dogs were safe, handing each terrified pup to a firefighter before evacuating his house through an air vent. WFAA-TV reporter Jonathan Betz went along for the rescue, and he noted that seven years ago during Hurricane Katrina, Leslie’s dogs would not have been saved. “[It was] really a stark difference from what we saw during Katrina when the rescuers that I went out with made the decision not to take the dogs and the pets with them,” Betz said. Shelter pets from New Orleans have been given refuge at the SPCA of Texas’ Perry Animal Care Center in McKinney, Texas and the Jan Rees-Jones Animal Care Center in Dallas. As Isaac crawled onshore in Louisiana Tuesday, 87 cats and 60 dogs were transported from the Louisiana SPCA to a safe haven in neighboring Texas. An additional 34 cats were transported to the SPCA of Texas facility later that day. The Texas SPCA has also taken in animals from the Humane Society of South Mississippi this week. In an effort to create even more room for evacuated shelter pets from the Bayou State, the Texas SPCA is offering a 50 percent discount on adoption fees. Tropical Storm Isaac is slowly crawling northward, but the storm’s heavy rains have left widespread flooding in its wake. The waters continue to rise Thursday morning, and officials have urged citizens to evacuate from several towns outside of New Orleans, according to CNN.